A design plan for a bathroom remodel can be started from the ground up. Flooring is a major element in the design of a bathroom. Bathrooms require floors that are slip-resistant, hygienic, repel water and tolerate humidity. Tile flooring is often selected for these reasons and because it is easy to maintain. Other products used for bathroom floors include laminate, vinyl, stone, glass and environmentally-friendly flooring such as cork or bamboo. Here some important facts to know about bathroom flooring products. Tile is one of the most popular products used for bathroom flooring. It comes in a variety of sizes, textures, colors and shapes. Some of today’s contemporary ceramic tile designs are made to look like wood. However, not all tile is appropriate for use in a bathroom. When you shop for tile there are a series of codes and ratings that will tell you a lot about the product. Tile certification. One of the best products for bathroom flooring is porcelain tile. Note that there is a difference between porcelain and ceramic tile when selecting tile for floors. While all porcelain tile can be classified as ceramic, not all ceramic tile is porcelain. Confused? For a ceramic tile to be classified as porcelain it must meet criteria established by the Porcelain Tile Certifying Agency (PTCA). Porcelain tile, as defined by PTCA, is a ceramic tile with very low water absorption (0.5 percent or less), as tested. Porcelain tile made for bathrooms is slip-resistant, non-porous and hygienic. The PTCA publishes a list of tile lines that meet the criteria. Water absorbency. Tile for a bathroom should not be porous. 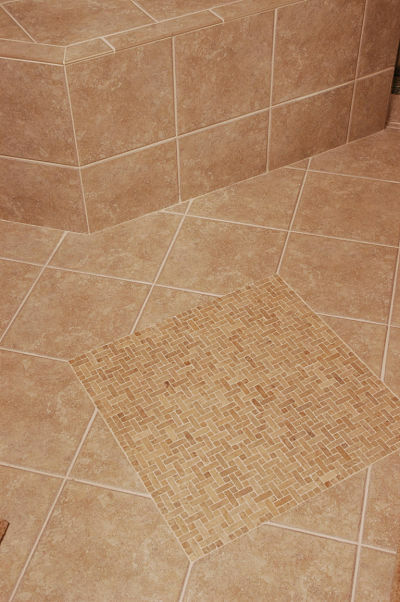 Tile is rated by its resistance to water. Tile can be “impermeable” and absorb less than 0.5 percent of its weight in water. 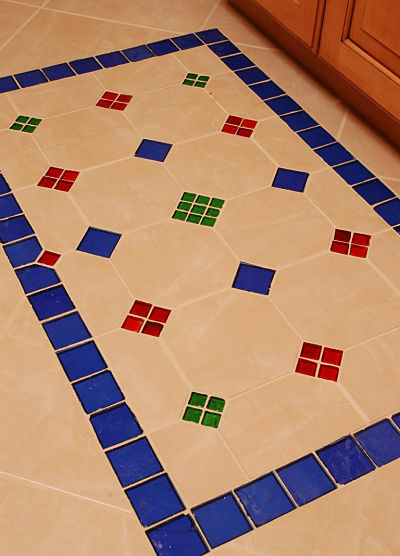 Tile can also be “vitreous,” absorbing 0.5 to 3 percent, “semi-vitreous,” absorbing 3 to 7 percent, or non-vitreous, absorbing 7 percent or more. Bathroom tile should be impermeable or vitreous. Tile quality. Ceramic tile is also graded for quality and use. Grade 1 is the highest quality tile, grade 2 has slight imperfections and grade 3 should be used for walls only. Grade 1 and 2 rated tiles can be used for flooring. Slip resistance. Floor tile is rated for slip-resistance. Slip resistance is determined by measuring the force required to slide an object across a surface and dividing that number by the object's weight to determine the “Co-efficient of Friction”. What should you look for? Higher C.O.F. numbers indicate that a floor will be less slippery. The C.O.F. ranges from 0 to 1.0. Slip resistant flooring for homes should have a C.O.F. of 0.5 or higher. 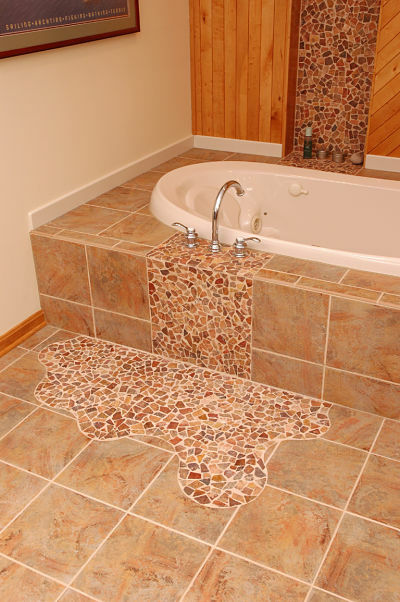 One of the hottest trends in bathroom design is the use of river rock stone flooring. River rocks are small smooth stones set in grout that come on mesh sheets for installation. 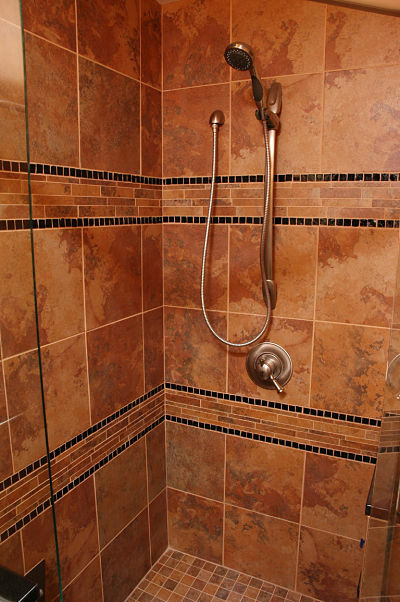 River rock is often used in shower stalls or as a floor or wall accent. There are glass tile products designed for use in bathrooms. Glass is non-porous. 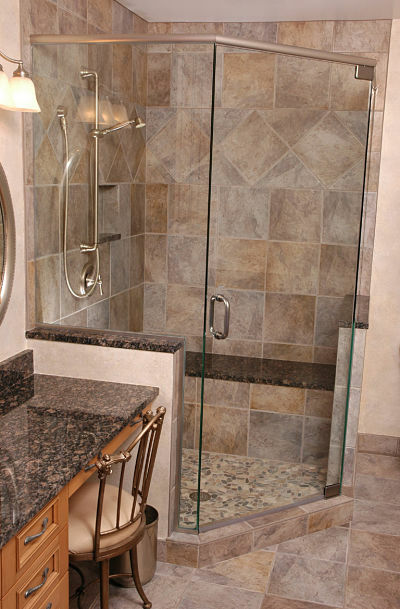 Textured glass and small glass mosaic tile are slip resistant, easy to maintain and beautiful. If you like the look of hardwood floors but worry about what a leaky sink or toilet might do to wood, laminate flooring may be a good option. Hardwood flooring can be used in powder rooms where humidity and spills are not an issue. Laminate flooring is made from resin and wood fiber and is durable. Laminates are scratch, dent and water resistant. Laminate flooring is also easy on the feet. The pluses of vinyl flooring include the cost, resistance to water and stains, and easy maintenance. If you decide to use vinyl in a bathroom look for top-quality vinyl sheets that reduce seams where water can seep through and cause mold or create favorable conditions for bacteria growth. Cork flooring has been getting a lot of press recently and has been a featured topic in many leading home improvement magazines. Cork is eco-friendly, hypoallergenic and resistant to mold and mildew. Cork flooring comes in a variety of colors and in tiles and planks. While water-resistant, cork is not water-proof. 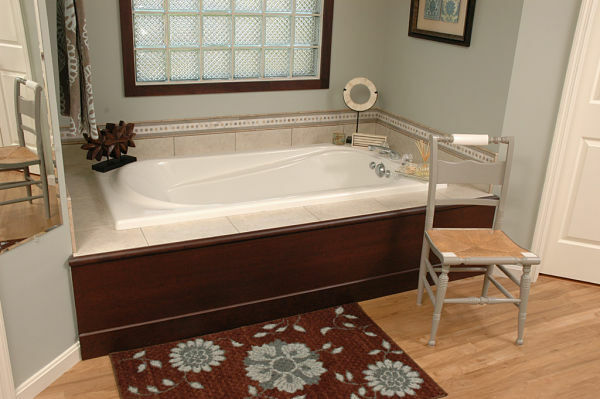 A polyurethane finish will protect the surface but mats should be used near the tub and shower. Solid bamboo flooring is being used in many homes, particularly in new construction, but is not recommend for bathrooms. Engineered bamboo is the product to consider it you like the look. Engineered bamboo is a waterproof veneer that is durable and easy to maintain. The major downside is that the flooring cannot be refinished when the finish wears down and must be replaced. Safe, functional and stylish bathroom floor design. To find the right flooring for your project it is often very helpful to work with a bath design professional knowledgeable about the different kinds of flooring products on the market. When selecting bathroom flooring, look at options for moldings such as baseboard molding or a row of tile where the floor meets the wall and options for shower thresholds. If comfort is important to you, consider radiant heated floors.